Nguyen Hung Duong (R) listens to his arrest warrant in Da Nang, central Vietnam, on November 11, 2016. A young man in the central city of Da Nang has been arrested for investigation after he was found cheating nearly 100 people of a huge amount of money by using Facebook accounts stolen from overseas Vietnamese. 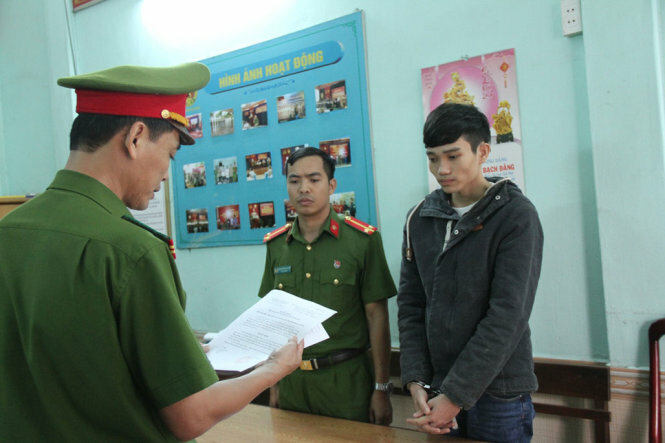 Nguyen Hung Duong, 22, has been put in custody for four months on charges of “using computers, telecom network and the Internet to appropriate assets,” Da Nang police said Friday. Duong is in fact a resident of the nearby Quang Tri Province, but moved to Da Nang to study cooking and information and communications technology, according to officers. He later started to learn hacking techniques and use the knowledge for fraudulent purposes. Da Nang police began to probe the case in October, after six months of investigation following numerous reports from overseas Vietnamese, who said their Facebook accounts had been hacked. According to officers, Duong made friends with many overseas Vietnamese via Facebook with the only goal of luring them into clicking a link to a malicious website, where they would lose their Facebook login credentials. The young man managed to steal nearly 110 Facebook accounts through the technique. After hijacking the accounts, Duong first carefully read the conversation history of those Facebook users to impersonate them when talking with their friends in Vietnam via Facebook Messenger. In those fraudulent conversations, Duong asked the victims in Vietnam to buy prepaid mobile phone cards for him to receive big commission. The offer is $10 for a VND100,000 ($4.5) card, and $50 for a VND500,000 ($22.5) card. After receiving the cards from the victims, Duong would convert the virtual money into real one and had it transferred to his bank accounts for personal use. Duong has managed to cheat nearly 100 people into buying cards for him since 2015, swindling a total of nearly VND2 billion ($89,286), police said. The victims mostly reside in big cities such as Hanoi, Ho Chi Minh City and Can Tho. The biggest victim lost more than VND50 million ($2,232) in the fraud.